We did this walk on 8th June 2008, walking between Balls Green and Barnes Street. For this walk we were joined by Simon, his Ukrainian girlfriend, and Denis, a Russian actor, who incidentally has a very small part in the new Batman Film and also appeared on the Graham Norton show a few weeks later. The others had already walked with Denis and Simon before but it was my first trip out with them. Despite meeting in the depths of Kent it turned out Denis lived a few streets away from me in Walthamstow which was a bit of a coincidence. Missing were Dave, and Derek who was suffering from knee problems. 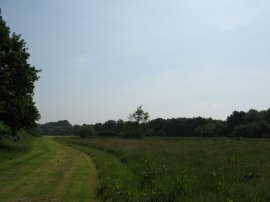 It was a nice bright sunny day and the weather stayed fair all day, ideal for walking. 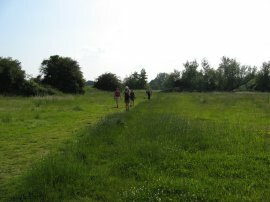 Rejoining the route of the Wealdway at Balls Green we set off along a footpath that follows the course of the river Medway over a number of meadows, photo 1, on what must have once been the flood plain of the river. 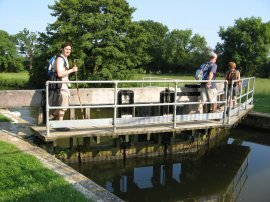 The route turns to cross over the Medway, where we stopped for a group photo on the bridge before turning to the left, briefly linking up with the route of the Sussex Border Path, and heading up to take a tunnel under a railway line. Once under the railway the route heads uphill through a very attractive stretch of countryside with grass covered fields surrounded by trees, photo 2. Reaching the top of the hills the route continues ahead to briefly join the A264 at Stone Cross. Here the route turns left then right down a minor road, and right almost immediately again to join a driveway. Just after I had reached the driveway a number of cyclists went down the road and I heard one crash and wondered for a few moments whether I should go and see if they were alright however I could hear that the other cyclists had stopped too so continued on. 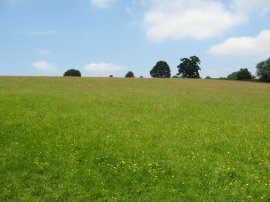 The route runs alongside a number of fields, including one planted with broad beads, photo 3, a crop I have seen a lot of when out this year, and on to the village of Fordcombe, crossing the cricket pitch to join the B 2188. Once again the Wealdway turns to the left along the road for a very short distance before taking a minor road off to the right. After a while the route leaves the road along a footpath on the right which is followed for a short distance over fields and past a garden down to another minor road where we turned left, passing the buildings of Silocks Farm and the end of the road we had previously been on. When we had left the first road we had briefly discussed the route with another walker who we now saw once again with the satisfaction of knowing we had followed the correct, if not most direct, route. The Wealdway leaves this road along a footpath on the right that runs down over a couple of fields and joins a footpath that descends into Avery's Wood, passing a number of trees which had completely engulfed the metal fence that had once lined the path. 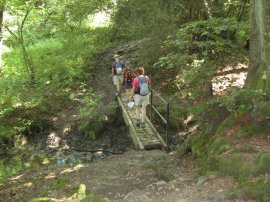 The route crosses a wooden bridge over a small and muddy stream, photo 4, and then starts heading uphill to join a minor road, (and the route of the Tunbridge Wells Circular Walk), at Bullingstone. Myself Chris and Val headed up the road a bit to the next junction where we waited for the rest of the group to join. After a while no one else appeared so we headed back down the road to find that Simon, Denis and Olena had some how got lost in the woodland, although had now been contacted and were back on the right route. Back on track we took a path from the road off to the left that runs over fields and then a rather overgrown section of path between houses to join a road in the village of Speldhurst. 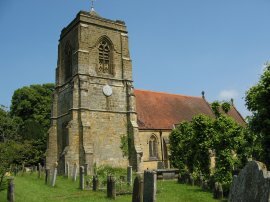 Here the route turns to the right, following the road round past the church, photo 5 and then turning and following the road downhill to the right. The Wealdway leaves the road along a driveway that runs down past a pet food shop and what once must have been a mill with a very old and decaying waterwheel besides the building. The route then heads uphill along a rather overgrown path to reach another minor road by the driveway of a house. 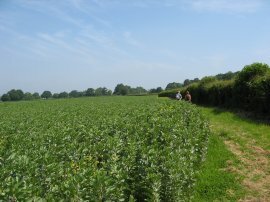 After a short wait for Simon, Denis and Olena to catch up, we turned to the right for a short while before taking a footpath off to the left that runs between fields. 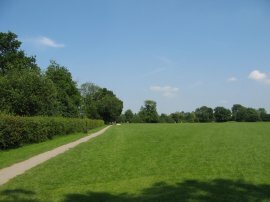 The route then turns left and heads on to join a road which is followed up to Modest Corner, by Southborough Common, where we stopped for lunch. Suitably refreshed we set off towards Bidborough, passing through the edge of the common before crossing over more open ground where photo 6 was taken. 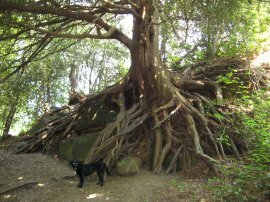 In a small patch of woodland we passed the tree in photo 7 with its impressive root system spreading out over the surrounding rocks. Eventually the route heads up to join a minor road on the outskirts of Bidborough, passing an old school building which had a stone plaque on the wall quoting from psalm xxxiv "Come ye children, harken unto me; I will teach you the fear of the Lord", which seemed a bit dramatic. Just before the school there was a park with a trim trail which Simon set off to explore and then when catching up with us he missed the turning up to St Lawrence Church, photo 8, and thus we had a further wait in the churchyard for him to rejoin us, in addition to the time spent waiting while he was in the park. 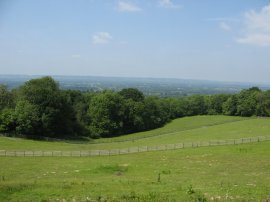 From the churchyard it was a short walk between houses to reach the B 2176 which runs along the top of the ridge over looking the Medway Valley towards the North Downs hills which appeared in the distance, photo 9. 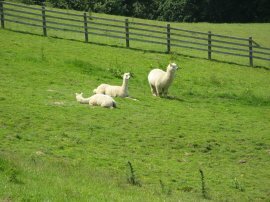 To the right the road was lined by houses but to the left were fields and in one of these there was a group of Alpaca's, photo 10. 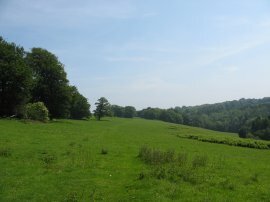 The Wealdway leaves the road by Waghorn's Wood, taking a footpath off to the left that starts descending down towards the A 21. Leaving the trees the route then heads alongside, and over fields, photo 11, as it makes its way steadily downhill to the road. 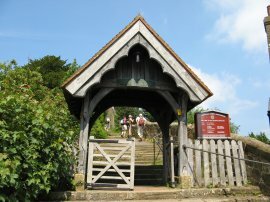 The route crosses a minor road and continues down under the A21 and on past a converted oast house to join a road that runs down to the small village of Lower Haysden. A pub is marked on the map here but has now closed. Leaving Little Haysden the Wealdway takes a hedge lined path into the Haysden Country Park. The path makes its way over a minor stream, crosses under a railway line before taking a bridge over the River Medway, photo 12, now much broader than where we had joined it at the start of the day. 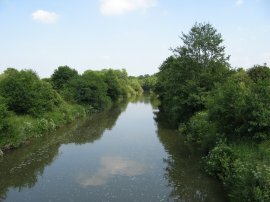 For the next mile or so the Wealdway follows the tree lined banks of the River Medway as it makes its way towards Tonbridge. Crossing under a railway line the route heads over a large stretch of parkland, photo 13, on the outskirts of Tonbridge. 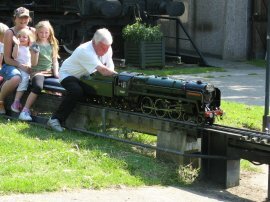 At the far end of the park, close to a swimming pool there was a miniature railway running with small scale steam locomotives, photo 14. A little while earlier we had joked that although Simon and co were running a bit behind the main group at least they couldn't get lost following the Medway however this had proved not to be the case and we had a bit of a wait, and an ice cream, outside the swimming pool while everyone joined up again. Leaving the swimming pool it was just a short walk up to the grounds of Tonbridge Castle, photo 15. 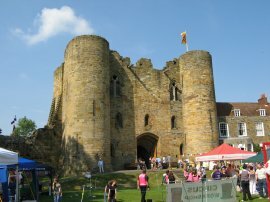 It was carnival day in Tonbridge and the castle was surrounded by a number of stalls and funfair rides. 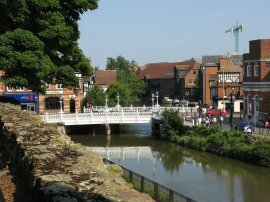 Leaving the castle the path crosses over the River Medway in the centre of the town, photo 16, and takes a footpath that runs along the opposite bank of the river. This runs past the town lock and on to the A26. Crossing the road the route rejoins the other bank of the river again and heads out of the town and back into the Kent countryside, running over grassy meadows, photo 17, and fields alongside the river. 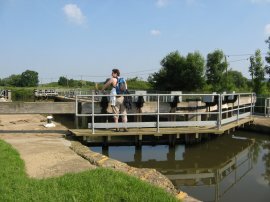 After about a mile the route passes Eldridge's Lock, photo 18. A mile or so down from the Eldridge's Lock, and having past Porter's Lock we stopped under the Hartlake Bridge for a brief rest out of the hot sun on the low concrete bank that lined the river under the road. 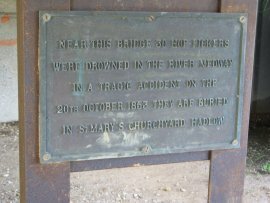 Also under the bridge was a small memorial, photo 19, to 30 hop pickers who had drowned at the spot back in 1853 when a horse and cart fell off an earlier wooden bridge into the River Medway which was swollen with flood waters. From Hartlake bridge we continued along the river to the East Lock, photo 20, where the route crosses back over the river for a short distance before taking one final bridge over the river and joining a footpath that led away from the river and up to Barnes Street and our parking place. 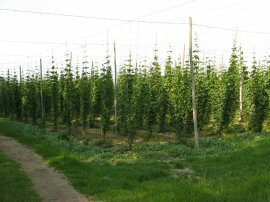 Besides this stretch of path there were a number of hop fields, photo 21, the plants growing high up the tall wires. 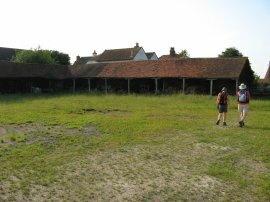 After passing a number of different fields the route turns first to the left, then to the right to cross an old farmyard, photo 22, to join the road at Barnes Street very close to where we had parked. According to my GPS we had walked 15.7 miles when we reached the cars. Overall we had walked at quite a slow pace throughout the day, with a number of spells spent waiting for all the group to meet up together which I actually found more tiring than if I had gone a bit faster without all the stops. After driving back to collect the other cars at Balls Green we then drove over to a pub at Langton Green where I had a very enjoyable meal sitting outside in the early evening sunshine.